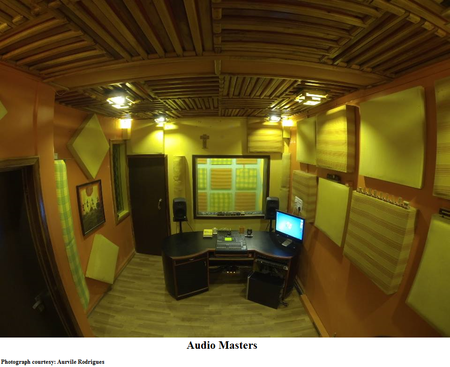 Music is this man’s life: that is the first impression you get of Aurvile Rodrigues who has his own recording studio called Audio Masters connected to his house. At the age of four he took to the drums and has been playing since then. He plays the bass guitar apart from the drums but his chief preoccupation is his recording studio. 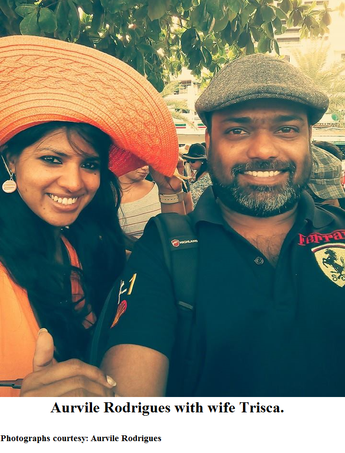 Aurvile sings too, and has sung many Konkani duets with his wife Trisca of DnT fame. Aurvile cites as his musical inspirations the singer Richard Marx and percussionists Dave Weckl, Steve Gadd and Simon Phillips. ‘Among the Indians I used to follow Assumption Nunes who played for a band called India,’ he says. His elder brother Lawry, who had his own band in Kuwait, played an instrumental role in motivating Aurvile and introducing him to other well established musicians in Goa. He is prominent for his presence as drummer for the bands Sky High and Bad Blood which he joined in 1996 and 1994, respectively. It was Bad Blood’s Nixon Soares who appreciated Aurvile’s skilled beats while he was a member of Aquatech and asked him to join Bad Blood. After Aquatech split up for good, Aurvile joined Blasio Pinto to be part of Sky High. ‘As of now we are the oldest band with the original members,’ says Aurvile of Sky High. 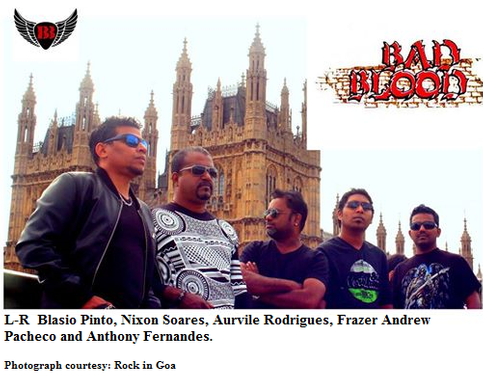 Bad Blood was booked to play at the Goan Festival at London in 2014. Since they had time between two major gigs, they approached local pubs and asked if they could play there. They played in around five pubs. Initially, they were looked upon with distaste for being Indian, but their fine playing won over their audience, who eventually admitted their quality of performance was superior than most, saying, ‘We didn’t know Indians could play rock so well.’ Aurvile says, ‘When we revealed we were from Goa, they were like, “Oh Goa! That explains it all”!’ Now the band has an open invitation to play at those pubs if they go back to the UK. Bad Blood is planning to release an album of original songs of which two have been recorded and four are still in the process of being recorded. The maiden album which will comprise of eight songs is to be released by the end of this year. Aurvile has twenty years of experience behind him, presumably making him one of the oldest sound engineers in Goa. His future plans are to do something for Goa. He is presently working on songs that will draw the youth of Goa closer to their mother tongue. He says, ‘I managed to change the scene somewhat when I remixed the song Meera Meera.’ The song went on to become a hit but much effort is still required towards furthering the cause of Konkani music and recognition for Konkani musicians on a national level such as was denied to other Goan musicians of high calibre in the past.